After the congress program, ICA 2018 delegates are invited to join different social events. On Tuesday and Thursday afternoon from 13.00 until approximately 17.30, ICA 2018 participants can choose from six different guided tours of Berlin’s most famous attractions as well as the hidden places in town. The field trips are included in the delegate ticket. The number of participants for each trip is limited. You are therefore advised to book well in advance. This trip combines all the advantages of a coach tour with the comfort of enjoying the sights of Berlin aboard a Spree river boat. See the highlights of the former Western and Eastern city center with the remains of the Wall, walk through the Brandenburg Gate and see famous sites such as the reconstructed Paris Square or the Government Quarter. Visit hot spots of the Cold War such as Checkpoint Charlie and Potsdamer Platz. After boarding the boat, you will see some of the main attractions from an entirely different perspective while smoothly cruising on the Spree. You already know the typical tourist attractions in Berlin and are curious to see the hidden spots of the city? This bus tour will take you to charming small streets with hidden galleries, cafes and green oases. Visit the fashionable districts of Kreuzberg, Prenzlauer Berg and Neukölln and see what makes them so special. Highlights of the tour will be a small waterfall in the middle of the city, the “alternative” nightlife district Oranienstraße and multicultural bustling street life and mosques in trendy districts. Discover the former airport Tempelhof, which has been turned into a huge public park, and find out where you can get the typical Currywurst. This trip covers all major sights of former East and West Berlin in one afternoon and gives you a feeling for the differences of the former Western and Eastern city. The bus takes you to the Brandenburg Gate, the Government Quarter with the Reichstag building, palaces from Prussian times and many other famous sights. You will also see residential quarters with a bustling street life and trendy districts on both sides of the former wall. Our guide will give you an idea of what it feels like to live in this thriving city today and how life is changing for Berliners as the city grows together since it has become the capital of the reunified Germany. This bus tour focuses on the Third Reich, Cold War, Berlin Wall and former East Germany, including its most important sights. You will see remains of Goebbels’ Ministry of Propaganda, the site of Hitler’s bunker and the Holocaust Memorial. Delve into the history of former East Germany and see the Wall Memorial at Bernauer Straße. You will visit the site of the famous tunnel 57 and a reconstructed part of the wall with a watchtower. The bus will take you to Checkpoint Charlie, an iconic landmark of the Cold War. Another highlight of the tour will be the former airport of Tempelhof where your guide will tell you more about the famous Berlin Airlift. This trip will focus on the places and traces of Jewish life in Berlin in the past and present. In the old Jewish Quarter of Berlin we will search for traces of the past and witness a new fl ourishing Jewish life in Berlin. We will see the city´s first synagogue, the Jewish museum, the “Scheunenviertel” district, sites of successful resistance against Nazi terror, and the city’s oldest Jewish cemetery. 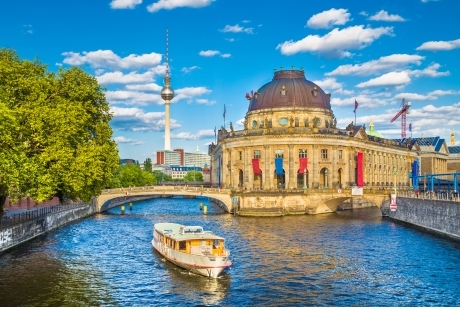 As the tour continues, you will learn about the cultural life of Berlin’s Jews, see the Jewish grammar school, kosher cafes and the beautifully renovated golden dome of the New Synagogue. You will feel that Berlin’s Jewish community, with its more than 10,000 members, is thriving again. This bus tour will show you the architectural highlights of Berlin and its challenges after reunifi cation as regards urban development – a city growing together after decades of separation. During the tour, your guide will show you Potsdamer Platz, an entire quarter built from scratch after 1995, or the Government Quarter with the “Band of the Federation”, a building complex which links the East and West sides of the city. You will see other unique buildings such as the Potsdamer Platz, the Hotel Waldorf Astoria, heritage-listed Bikini Berlin complex and Kranzler Eck. At the construction site of the Humboldt-Forum, have a look at the rebuilding of the old baroque facades of the City Palace, yet another unique architectural project in Berlin!